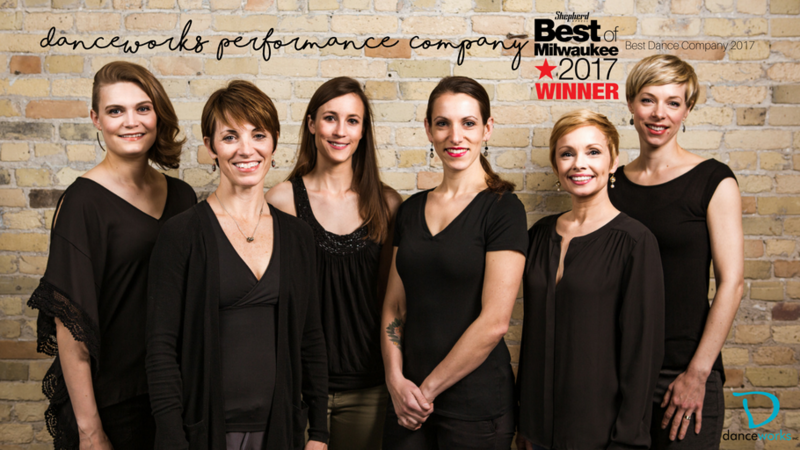 Danceworks Performance Company was founded in 1997 by a group of talented young dancer/choreographers who spilled from the halls of the UW-Milwaukee dance program and onto the Milwaukee dance scene. These dancers included Anina Bacon, Becky Blong, Cynthia Collins-Sinotte, Joan Fernandez, Andrea Hill, Jen Moore, Laura Teska and Sarah Wilbur, and they shared three things. First, they had been trained by the faculty of the UWM dance program (Marcia Ruth Parsons, Ed Burgess, Janet Lilly and Ferne Caulker) as well as a series of stellar visitors to the program. They also shared an interest in staying in Milwaukee to create and perform their own work. Finally, they envisioned a company of dancer/choreographers, a highly trained ensemble that supported several distinct voices within a shared aesthetic. The Danceworks board of directors invited Sarah Wilbur to become the artistic director of Danceworks Performance Company, the first contemporary dance group to emerge in Milwaukee in over a decade. Less than a year after Danceworks Performance Company’s debut, Dani Kuepper became a member of the new company, immediately establishing herself as an up and coming choreographic talent. After many years of collaboration, Sarah Wilbur and Dani Kuepper became Co-Artistic Directors in 2006, sharing choreographic responsibility and artistic vision. Since Sarah Wilbur’s 2007 move to the west coast, Dani Kuepper has taken the reins of leadership as the Artistic Director. Since its inception, Danceworks Performance Company has been performing to critical acclaim. The new artistic leadership, along with the accomplished company dancers, promises to achieve new bounds of artistic achievement this season and into the coming years. Check out some of the great press Danceworks Performance Company has received. Questions? Contact Dani Kuepper, Artistic Director, at 414.277.8480 x6001 or via email.